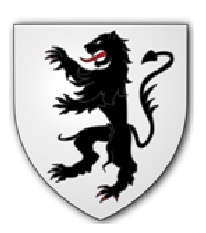 Whilst several sources have suggested that the lion derives from the arms of Henry de Lacy, Earl of Lincoln, who built Denbigh Castle, it should be considered that the castle was constructed as an instrument of suppression of the local population and it would therefore be rather peculiar for the council’s arms to celebrate this aspect of the locality’s history. 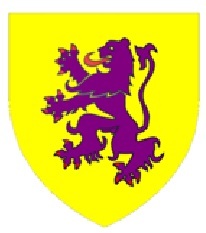 Additionally the De Lacy arms were unequivocally acknowledged as being yellow with a rather unusual, distinctly purple lion. Whilst in this illustration the upper half of the lion appears to be green, the context makes it clear that this was intended to be the black lion on white of Powys Fadog, to represent Denbighshire, whilst the lower half being a red lion on gold represents Montgomeryshire. Accordingly the armorial banner based on this design, which has been a persistent and widely used county emblem, has been suggested as a likely flag for the county. It can be purchased here. which certainly makes a more visibly effective flag than the all white version, which would inevitably be frequently indiscernible against cloudy skies. Thanks to Brady Ells and Philip Tibbetts for their contributions to this account. The Denbighshire flag is available to buy here. This entry was posted in Denbigshire. Bookmark the permalink.